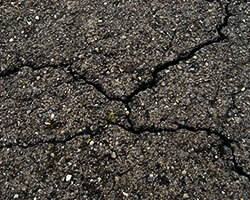 Asphalt cracks are unsightly and can get expensive to repair if left for too long. That's why it's best to repair cracks as soon as they form. If you are looking to repair the asphalt at your home or business, Asphalt Kingdom has the equipment and advice you need to do the job right yourself! Water is one of the worst things for asphalt cracks—once under the asphalt surface, it can erode the foundation or freeze (which causes heaving). Cracks can accumulate debris, dirt, and can start to grow weeds. Fixing cracks before they become potholes is the smartest thing to do—it also saves you money by extending the life of your asphalt. Do you have asphalt blacktop that is starting to crack? If you do, you're certainly not alone. Asphalt deterioration often becomes quickly evident after a period of icy or snowy weather when thawing can cause blacktop pavement to crack, crumble and decay. This is especially true for asphalt that isn't properly sealcoated. The key to maintaining asphalt blacktop is filling cracks as soon as you see them. Putting off repair work will only lead to more damage and possibly even the need for costly asphalt replacement. There are many different situations that require crack repair or crackfilling. In many situations, cracks can be caused by a poor foundation, by not having a thick enough layer of asphalt, or having a layer of asphalt that is too thick. Sometimes when the asphalt is originally installed the asphalt mix is not blended properly. Earth movement, extremely heavy vehicles, roots from trees, and the freeze-thaw cycle every year are also factors in creating asphalt cracks. It is extremely important to repair any cracks that arise and maintain an ongoing asphalt crack repair maintenance program every year. If you do not repair the cracks, water will enter into the asphalt's foundation, which will begin to erode. This results in potholes and depressions, which will lead to extensive damage and costly repairs. Weeds can also grow in cracks; their roots causing even more damage. This is the most time-consuming and most important part of the job, but it's also easy for any DIY'er. To get the longest-lasting repair, the crack seal needs a clean and solid area to stick to. Any debris or weeds that are left in the crack will degrade your crack repair job. A pro would use specialized crack filling equipment like a heat lance, but you can get the work done with simple tools you likely have in your tool box. If you have weeds or grass growing in your asphalt cracks, pull them out all the way down to the roots. If you can't pull the roots out, you can use a bit of vinegar to kill them. Use a chisel or screwdriver to scrape out any loose rocks, debris, or leftover vegetation from the cracks. Then use a wire brush or hard-bristled broom to sweep out any dust; you can also use a gas blower to speed things up. The success of a crack repair job depends on having a dry, solid area. That means you can't just use a pressure washer, as the water will take too long to dry. If you do use a pressure washer, an air compressor or even a hair dryer could be useful to dry the area thoroughly. While you're cleaning the cracks, make a note of how wide and deep the fissures are. Basically, you want to divide the pavement cracks into two groups: shallow cracks and larger ruptures. This is important because they are repaired in different ways. Don't stop looking at the obvious; keep an eye out for surface spidering damage on the pavement. That's a sign of a dry brittle surface, telling you it's time to apply a seal coat. Shallow cracks are cracks that are about a half inch deep or less. With shallow asphalt cracks, you don't need to get a ruler out to measure the depth. If you check your asphalt frequently and you have just noticed some cracking, the depth is likely to be shallow. Deep cracks are over a half inch deep. With deep cracks, you should fill it with sand until it reaches a half inch depth. Crack filling asphalt cracks this small is easy. Cold pour crack filler is easy to apply and is perfect for homeowners. You can use a caulking gun as your crack filling equipment (or simply pour a little bit at a time on your crack) and a U shaped squeegee. Simply apply and fill the entire crack, then squeegee and allow the crack seal to dry. This type of crackfiller is NOT recommended for large cracks. Cold crackfiller has a tendency to sink into the wider cracks and sometimes pour right through to the foundation, preventing it from ever being filled. Though the crackfiller is still sealing the crack, aesthetically it looks as though it has sunk deep into the crack. This type of repair is more challenging, simply because it needs rubberized hot pour crack filler. If you're a homeowner, you'll need to hire a pro who has proper crack filling equipment to heat and apply, or you'll need to invest in the tools to do it yourself. 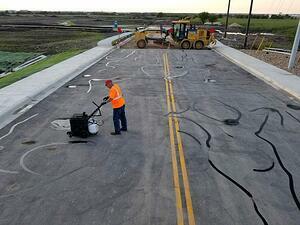 Once the hot pour is melted, crack filling asphalt is easy. Apply, making sure to fill all the crevices and corners. Slightly overfill, and tamp down firmly with an oiled piece of plywood and your vehicle. Allow the crack seal to cure and dry. Note: Hot pour is best for damage that is 2 inches wide or less; any larger and you have a pothole that needs an asphalt patch. Patching potholes that formed on your asphalt driveway is a simple repair process that anyone can do. At present, there are products that have made driveway repair jobs easier and much cheaper to do by ordinary homeowners, even those who are not normally into DIY home improvement projects. One of these products is the Cold Asphalt Patch, a cold pothole filler that has simplified pothole repair into three easy steps. The first step is to remove any soil, debris, or loose asphalt pieces found inside the pothole. If the pothole has loose or crumbling edges, smoothen those out with a chisel until the edge is solid asphalt. When you patch asphalt, this cleaning step is very important. Making sure that the pothole is clean will ensure that the repair job will last and the pothole will not reappear after a few months. Next, pour a first layer of the Cold Asphalt Patch into the pothole. Tamp it down with a tamping post or a shovel. This action will pack in the patching product tightly in the hole and remove air pockets. After this, fill up the pothole with the Cold Asphalt Patch all the way to the top until a small mound has formed. The third step when you patch asphalt with this product is to do a final tamping. You can use the tamping post or even your car. Drive your car back and forth over the mound until it is level with the ground. The simplicity of the repairs when done with this product compared to the when you use the traditional hot asphalt may make you think that the results might be not as permanent. On the contrary, repairing with the Cold Asphalt Patch will give you the same results. This product is basically hot asphalt that has been cooled down. Thus, when you patch asphalt with this product, it will bond with your asphalt driveway simply because they are of similar materials. Aside from simplifying the repair process, the Cold Asphalt Patch also has several other advantages that homeowners can benefit from. It is cheaper because you don’t have to buy equipment to melt asphalt and apply it. Besides, asphalt melter applicators are not cost-effective for homeowners as these won’t be used often. Since you are not using hot asphalt, repairing an asphalt driveway is much safer as well. You will not get exposed to fumes and hot temperatures when you patch asphalt potholes with this product. With hot asphalt, you need to make sure that the ground is very dry, which means that you have to wait for a few days if it has been raining. In contrast, the Cold Asphalt Patch can be applied even when the pothole has some water in it. The traditional way of using hot asphalt also requires the driveway to be closed off to traffic for a few hours while waiting for the asphalt to dry up. This inconvenience is completely gone with the Cold Asphalt Patch. When you patch asphalt with this product, it sets inside the pothole quickly and can be as hard as rock in just three hours. Pro Tip: When you have a high ridge on your hot crack fill use your torch to blend the edges for a better look. Don’t go overboard with the heat just use a low flame to glaze the edges down. Use coarse sand to prefill the cracks so the crackfill will fill it in one pass, if you don’t you will end up having to go over it many times for deep cracks to fill it correctly. When you price your jobs break out the crack fill and make it optional so the Sealing job is in line with your competitors who may not have priced it in their quotes. This also protects you from the client saying they thought your quote included crackfill. Finally, top the repaired line with sand. You can apply sand by hand or use a sand dispenser. Why use sand? It makes the crack filler ready for walking on much earlier than if you don't put sand on it. On hot summer days, the rubber filler won't become too sticky if it has sand on it. Sand on top of your crack repair adds durability to the surface of the crack fill, making it more resistant to wear and tear. It also helps to create a bond between sealcoating or asphalt sealer and the asphalt surface, so the crack filler doesn't repel the sealer. Now that the crackfiller is in, let your repairs cure for 24 to 48 hours. If you have any potholes, now is the time to repair those too. It’s a lot easier to fill them now than it used to be. We’re pleased to offer our new Asphalt Kingdom Cold Asphalt Patch that is so easy to use and apply that the owner of the company actually fills potholes while wearing a suit! This rapid-setting cold patch works in any season, and takes just three easy steps from start to finish. Once that is done, you can sealcoat the asphalt to lock your crack repair under a protective layer. Wondering what steps you need to take to do asphalt driveway repair yourself? It's easy as can be! Follow our quick guide at the link and you'll be ready to seal up your driveway before temperatures start to drop. If you're working on a property that requires line striping to mark the parking areas, the sealcoating will have just covered all those lines. Wait for 12 to 24 hours for water based paint, and 48 to 72 hours for oil based, before starting with the painting of parking lot lines. What's with the time window? If you're confused about why the timing isn't precise, sunshine has a dramatic effect on how fast your asphalt treatments will cure. Sealcoating should be regularly applied every two to three years. For best results, use only a professional-grade coal tar sealer that provides optimal rejuvenation and protection. Asphalt Kingdom’s sealer is perfect for the weekend “do-it-yourselfer” because it is extremely fast-drying and easy to use. A five gallon drum of our sealer will cover up to 300 square feet of asphalt. This essential blacktop resurfacing product can be applied with a sealer brush, squeegee, or one of our spray systems. Larger quantities — such as the 55-gallon drum and 275-gallon tote — are better suited for parking lots, airports, and other large areas of asphalt. Our supply calculator will let you know exactly how much product you need. If you have a parking lot, then you need parking lines. 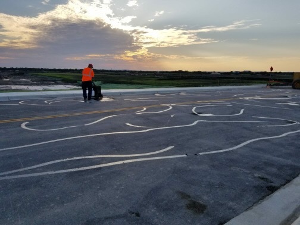 After crack repair and sealcoating, your parking lot's lines will be under a layer or two of black sealer. You need to refresh your lines with new paint. A small parking lot can benefit from a small linestriper that uses aerosol cans, while larger parking lots can get super sharp parking lines from a Titan PowrLiner. Our free property owner course teaches you everything about maintaining parking lots. Whether you're a professional sealcoat company, a property or estate owner, landscape firm, chimney sweep, or other profession that could benefit from adding a new service to your business to increase profits, consider filling asphalt cracks for your customers. Having both crackfilling and asphalt sealing available from one contractor means less hassle for your customers; they'll be more likely to do business with a company that makes it easy for them to get everything they need done at once. In the long term, it saves them time and money - and we're all looking to save both of those! You're definitely in the right place if you're looking for advice (1-866-399-5562) regarding asphalt crack repair. Whether you're looking for crack repair equipment or asphalt crackfiller we will guide you down a path so that you get your job done the right way and that it also matches your budget. And remember to take advantage of our free online courses on Home Asphalt Repair & Commercial Property Asphalt Repair.